I am upgrading NSX Manager from 6.1.4 to 6.2 in the environment with two vCenters configured in Linked Mode. Suspecting there may be a compatibility issue between the new NSX Manager Web Client extension and the old version, I tried to restart vCenter Web Client service on the vCenter where NSX Manager was not upgraded yet but it did not help. To proceed with the upgrade I stopped the NSX Management Service on the second vCenter and re-lauched Web Client. As suspected, Web Client successfully discovered one NSX Manager and all three NSX Controllers. 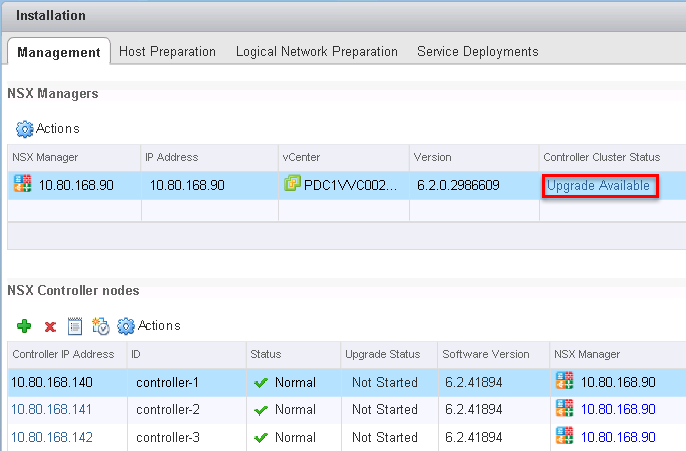 Click on the Upgrade Available to upgrade NSX Controllers.